With Web Sketchpad, it’s easy to craft tools that are tailor made for the task at hand. I was reminded of this flexibility several weeks ago when creating an interactive model for the elementary curriculum Everyday Mathematics. My goal was to design a lesson focusing on the triangle area formula, A = bh/2. In particular, I wanted to address the common student belief that a triangle has only one base and one height. 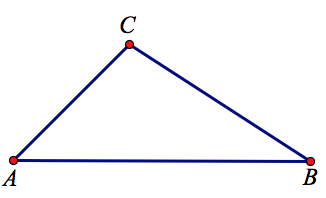 Given a triangle like ABC below, for example, students can identify AB as a base, but are less likely to realize that any of the triangle’s three sides can serve as the base. And identifying heights can be problematic, too, especially in obtuse triangles where two of the heights do not sit inside the triangle. While a textbook can display and label the three bases and heights of triangle ABC, this approach is hands off. I think it is far preferable to give students the tools to construct these heights themselves. How might such tools work? I considered offering a perpendicular line tool so that students could construct a perpendicular through each of the triangle’s three vertices and then use these perpendiculars to construct the three heights. But as a first introduction to triangle area, this approach felt too complex. I opted instead for a tool that automates the steps of constructing a height once a student specifies a base of the triangle and its opposite vertex. You can try the Construct Height tool for yourself in the interactive Web Sketchpad model below (Aside from experimentation, the best way to learn how the tool works is to watch the video at at the end of this post.) The tool not only builds heights, it also measures and labels the heights and their associated bases. Students use the tool three times, once each for the three identical triangles, picking a different base each time. They then use the calculator tool to compute the area three times, using the three sets of base and height measurements. Lo and behold, all three answers are the same! My Construct Height tool is a good first step in shaking common student misconceptions about base and height, but I ultimately wanted students to be able to identify the pairs of bases and heights themselves. With this in mind, I developed a follow-up activity with a new tool that removes some scaffolding. Too often, curriculum developers and teachers are limited by the sets of tools that come pre-baked into mathematics software. Web Sketchpad makes it relatively painless for anyone with knowledge of desktop Sketchpad to design highly specific tools that focus students’ thinking on those aspects of a problem that we feel are important. This triangle area problem is just one example of how we can develop a progression of related sketches, each with a different set of tools, that gradually gives students more independence and responsibility as they move from one toolset to the next.